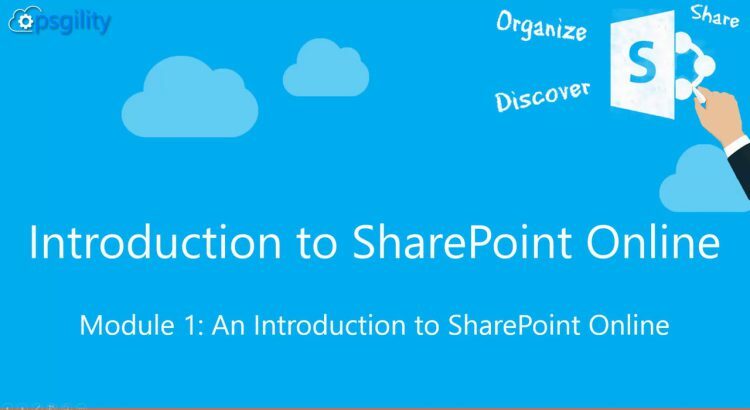 Home > Blog > “Introduction to SharePoint Online” Course from Opsgility Now Available! I recently completed writing and recording an online course for the online training company Opsgility that’s an introductory course to SharePoint Online. This 10 module course covers the basics of using SharePoint Online, including how to work with related applications such as Office 365 video, Delve, and OneDrive. Each module contains a recorded lecture that’s about an hour in length, as well as a hands-on-lab you can use to get experience with the topics covered. The course is meant either for end users who want to know the basics of how to use SharePoint, as well as for IT professionals who have been tasked with implementing Office 365 and want to know how SharePoint Online works so they can support their user base. Learning about how SharePoint can be used in conjunction with overarching organizational goals such as compliance, governance, utilizing business intelligence, and more. https://www.opsgility.com/courses/player/introduction-sharepoint-online. To access the course, you’ll need to purchase a license to the Opsgility site. The license will give you access to the entire library of courses. If you are interested in having me deliver this training personally, please contact me. I’m happy to deliver this course to you remotely or to come onsite and deliver the course to you in person.